Easter weekend has always marked the end of summer. Growing up, it was traditionally the last weekend of good weather where it was possible to head away camping for the weekend before the cooler temperatures and rain set in. This year was no different, and we spent quite a bit of time outside enjoying last of the warm sunshine that we were lucky to get. Certainly not swimming weather, but nice enough to be outside in. B and I headed up to my Dad’s house in the north of the state and spent a few days with family up there. We took Maggie along for the ride, who slept the entire time on both car trips, but was a little confused and upset about having to stay outside once we reached our destination. We have become increasingly more relaxed with rules for Maggie since we got her and she now sleeps inside -on the spare bed which she has claimed as her own – so to be kept outside at my Dad’s left her somewhat bewildered and disgruntled. On Saturday we went for a day trip – in the morning we headed off to Derby, a quaint little town about 20 minutes drive further north-east where we took the dog for a walk and had the most delicious Devonshire tea, something I had been hanging out for since my last trip to Derby about 10 years ago! There’s something about a freshly brewed pot of tea and a warm scone straight out of the oven with homemade jam and freshly whipped cream that I can never say no to. It reminds me of home. In the afternoon we went on a tour of some of the local wineries with my Dad, which was a very fun way to spend the afternoon. The wine region in the north east of the state has a temperate best suited to white wines which pleased B who is more of a beer drinker, and only just starting to appreciate some lighter styles of wine, whilst Dad and I both prefer a more full-bodied red. In saying that though we still all found a few wines we liked and shared a few glasses and a cheese platter full of locally made cheese at the finally vineyard we went to – a lovely old restored building overlooking a dam and row upon row of grape vines glowing beautifully in the late afternoon sun. One of the things I love about heading up to see my family up north (asides from the actual ‘seeing them’ part of course!) is the bounty of fresh veggies they gift us from my Dad’s amazing veggie garden. This time round we came home with a fair few kilo of tomatoes, some squash, and some freshly foraged mushrooms. I spent the rest of the weekend cooking the tomatoes any which way I could think of – roasting them, turning them into soup, sauce and a stew. Expect quite a few more tomato recipes on here over the next few weeks! I had been wanting to experiment with soaked buckwheat pancakes since first hearing about them over at The Briny. 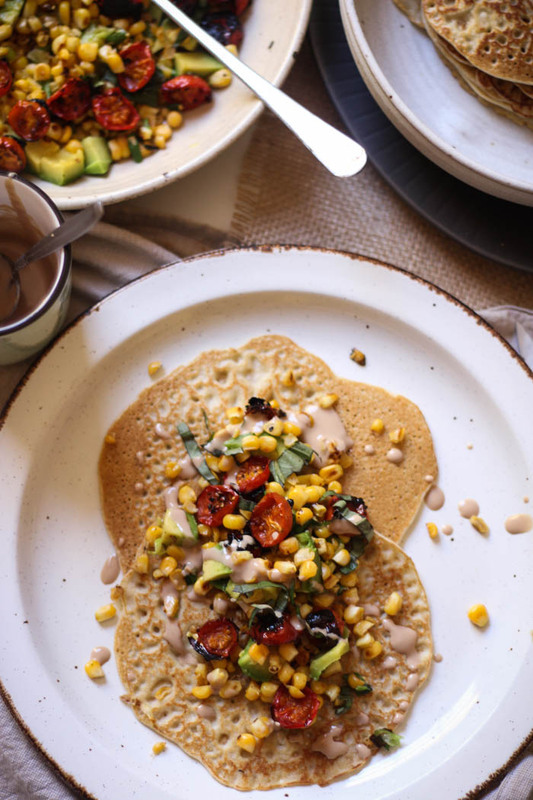 The recipe is ridiculously simple and the pancakes themselves are not only delicious but also healthy being made with soaked buckwheat (for more information on the hows and whys of soaking grains head over here). They are thinner than a traditional pancake – more like a crepe – and work great at wrapping up your favorite pancake topping. 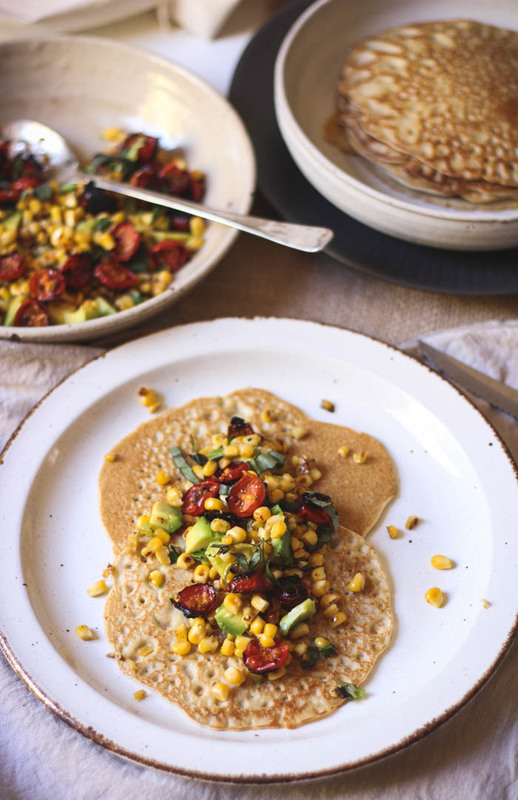 I’m sharing my favorite topping with you today, as well as a simplified recipe for the pancakes (I used an egg, but for a tried and tested vegan version, head over to see Jaime’s version) which makes the most of the late summer produce around at the moment. The salsa is amazing on it’s own and I’ve made it again since and served with a fried egg on top, and again with some lightly toasted brown rice – even if you prefer your pancakes with a more traditional sweeter topping, the salsa holds it’s own and I definitely recommend you try it too! The night before you wish to eat the pancakes, add the raw buckwheat to a large jar or container and cover by an inch with water and 1 tsp lemon juice or apple cider vinegar. In the morning, rinse and set aside. 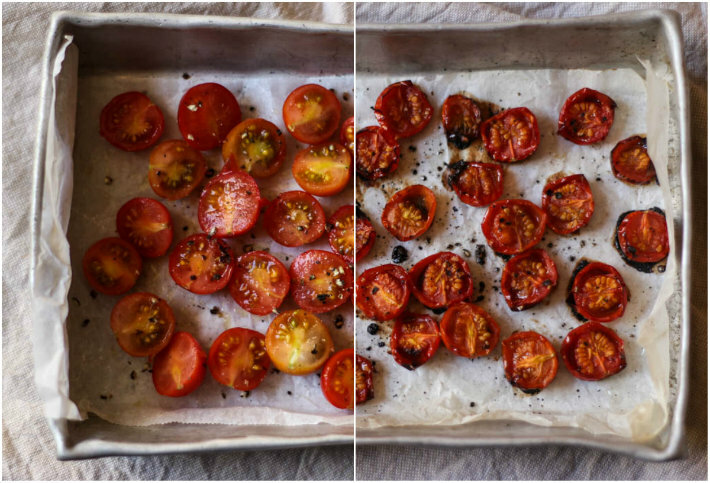 Halve the cherry tomatoes and spread out in a single layer on a lined and lightly greased oven tray. Place in the oven and roast for 40 minutes. In the meantime, sour the milk by placing just shy of a cup of milk in a jar and stirring through 1 Tbsp of lemon juice or white/apple cider vinegar. Stir and leave to sit around 15 minutes. To make the pancakes add the rinsed buckwheat to a high-powered blender such as a Vitamix with the soured milk, egg and pinch salt. Blend until combined and smooth. Heat a medium sized fry pan over medium heat and add 1 - 2 tsp coconut oil. Pour in about 2 - 3 Tbsp of the pancake mixture and swirl the pan or use a spatula the spread out the pancake to be about 1/3 cm in width. Cook until lightly browned on the bottom side, then flip and cook until the other side is also lightly browned - this should take a minute or two each side. Once cooked, placed the cooked pancake on a plate and then continue to cook the rest of the mixture following the process above. To prepare the salsa, combine the roasted tomatoes with the other ingredients and toss together. To make the salad dressing, combine all ingredients in a small bowl or jar and stir/shake until smooth and combined. To serve, place one or two pancakes on a plate, spoon over some of the salsa and drizzle with the dressing. After roasting the tomatoes, place the cooked pancakes on an oven-proof plate and place in the still-warm oven until they've all been cooked. 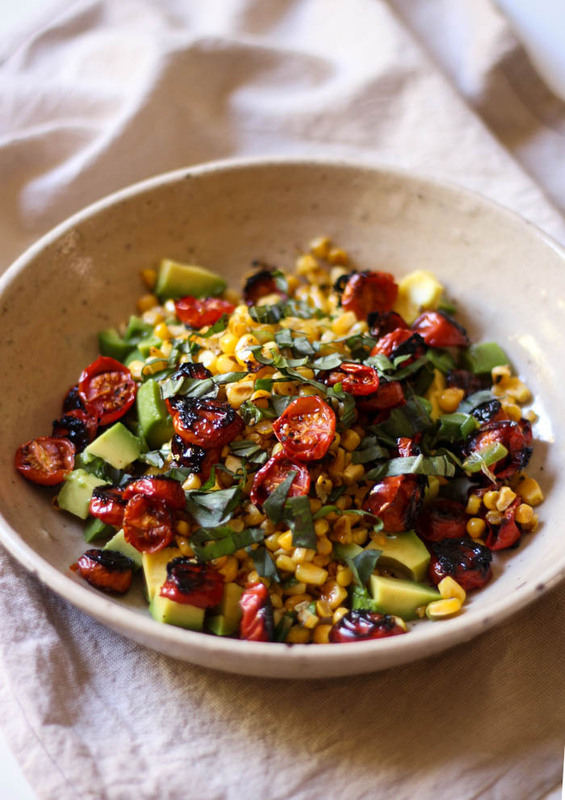 Ahh, these are so beautiful and that savory topping looks amazing — the combination of buckwheat + tomato sounds incredible and I love the bright summer vibe. I can’t wait for summer tomatoes up here! These pancakes look so delicious! Your recipes always inspire me to make more savoury breakfasts. Also your pics are so stunning!! 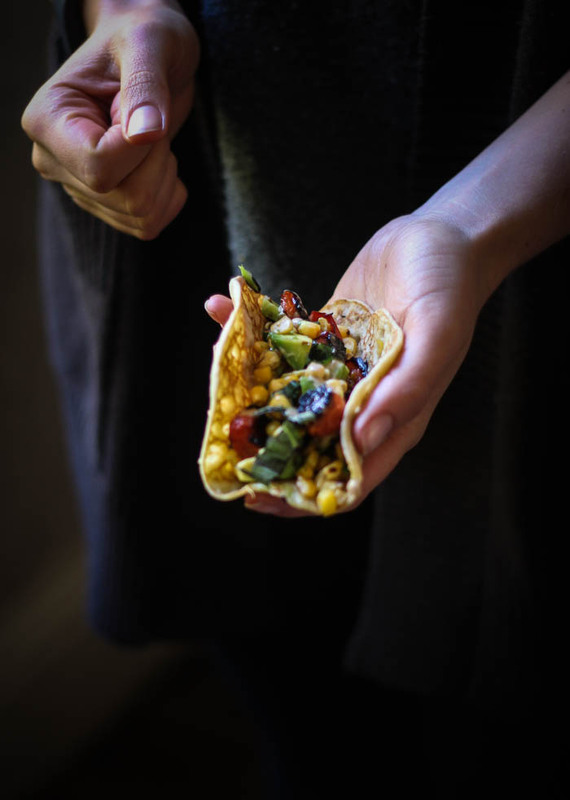 I made these for dinner last night and they were amazing! Anytime I have avocado in something I usually go with Mexican or Asian flavors, so I liked the corn, balsamic, and basil/mint spin this time. Love how easy the buckwheat pancakes are to make. And thanks to the buckwheat they have more heft and staying power than regular crepes, which makes it perfect to base a meal. Thanks Dearna! 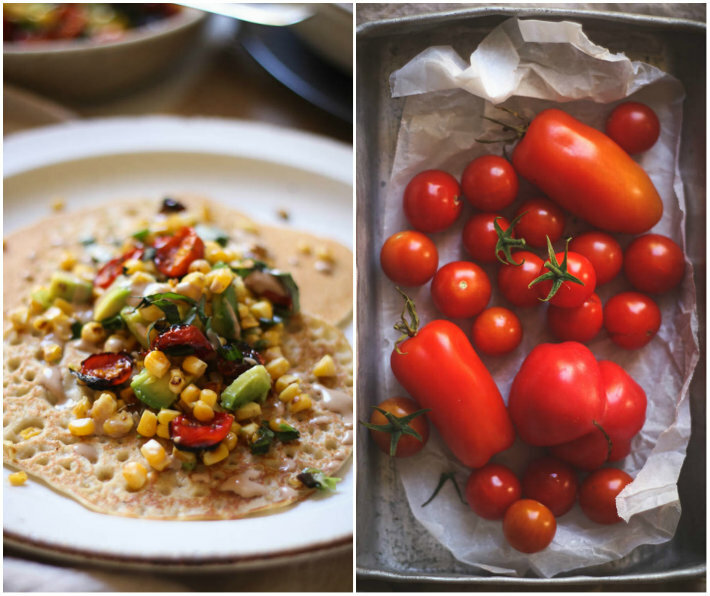 You have captured these buckwheat pancakes perfectly.. they look divine and I am loving that roasted tomato salsa. Yup! Treats are definitely part of a healthy lifestyle! Yay for wine and chocolate *-* And so glad you enjoyed yourself!